Replacing multiple adjoining front teeth with implant-supported bridges will reduce your treatment cost. Usually, we recommend placing one implant per missing tooth, especially in the posterior (back) of the mouth, where the chewing forces are greater. 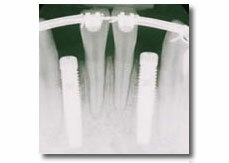 However, when designing a case to replace several missing adjacent front teeth, a restorative dentist or specialist may recommend a dental implant bridge instead of individual crowns. The reason for this is due to anatomic limitations and esthetics. Replacing multiple adjoining front teeth with implant-supported bridges will reduce your treatment cost and improve the esthetics of your smile.